Start in town from Stearns Park and ride along Lakeshore Drive. The shoulder is wide and paved. You'll cross a river, go past a scenic golf course and come to a fork in the road. Follow it to the left on M-116 and soon you'll see sand dunes along Lake Michigan. 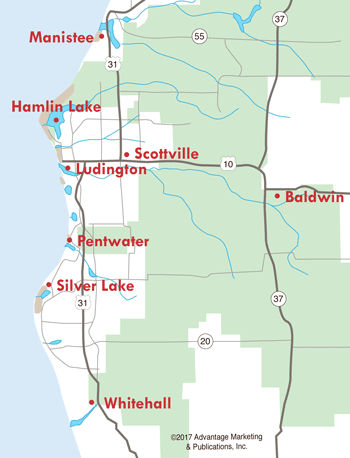 This will take you all the way to the Ludington State Park. 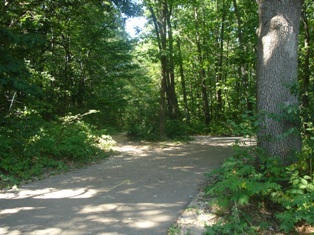 You'll find 1.5 miles of paved bike paths throughout the park. Here you can view woods, marshes, sand dunes, and the shoreline of Hamlin Lake. You can also bike on the 1.5 mile gravel road to Big Sable Point Lighthouse. Bike rentals are available at the Hamlin Lake Concession Stand. The Shoreline Cycling Club has just cleared an area within the School Forest for bike riding, separate from the hiking trails. Approximately three miles are now ready in the area, with two more miles planned. The trails will wind through some tight spots and feature challenging turns. The trailheads will be at the disc golf parking area off Jebavy Drive just north of Tinkham Avenue...and at the corner of Sherman Street and Tinkham Avenue. 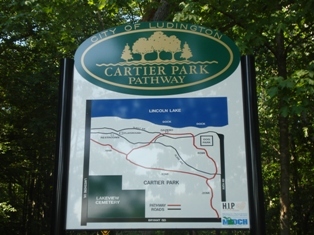 At the intersection of Bryant Road and Rath Avenue in Ludington is the entrance to the bike trail at Cartier Park, located just a mile from downtown Ludington and beaches. 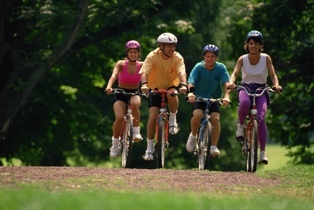 It is a one-mile paved loop and bikers are treated to serene, wooded surroundings. There is a campground here on both sides of the bike trail. View the beauty of Lincoln Lake, complete with boat launch and fishing dock. Bike along Stearns Beach, down Loomis Street and past the Ludington Municipal Marina. Continue on to Harbor View Marina, along Rath Avenue. Our side streets have little traffic, and the sights are fantastic. This 22.5 mile paved trail winds through the beautiful fruit orchards of Oceana County. You'll pass by the communities of Shelby, Rothbury, New Era and Montague. If you need to rent a bike, you can do so in Mears or Shelby. The trail will be getting a facelift in June 2015, with a re-paving of the entire trail and widening it to 10 feet. Work is expected to be complete by October 2015. Bikes are welcome to ride north of Tippy Dam off M-55 east of Manistee, but not south. Also off M-55 near Wellston is the Big M Loop, an invigorating route for experienced cyclists. Be prepared for aerobic climbs to the top of Capper's Peak, with stunning views of the Manistee Forest. On Caberfae Road you'll find the MacKenzie Trail, which connects to the Caberfae Ski Area. There's so much to see here in the great outdoors, and the air is fresh and clean. If you're planning a trip here, don't forget bikes for the entire family. It adds a whole new meaning to fun!